PSHE education at Brookfield seeks to develop the knowledge, skills and attributes children need to manage many of the opportunities, challenges and responsibilities they will face as they grow up. Learning is grouped into four core themes: self-awareness, keeping healthy and safe, citizenship and respect and relationships. Our aim is to build children’s self-esteem, resilience and empathy; to provide them with the knowledge and skills to develop healthy lifestyles; to equip them with a sound understanding of risk so that they can make safe and informed decisions; to prepare them to play active roles as responsible, global citizens; to support them in developing positive relationships; to strengthen their ability to collaborate and think critically; and to help them understand, accept, respect and celebrate diversity. Our work as a Level 1 Rights Respecting School complements and enriches our PSHE provision and many lessons are linked explicitly to rights within the United Nations Convention on the Rights of the Child. In addition to distinct PSHE lessons, aspects of the curriculum are delivered and/or reinforced through cross curricular links in Science, Cooking and Nutrition (D&T), Geography and RE. 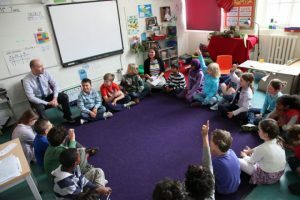 Classes also have regular circle time, which provides teachers with the flexibility to deal with issues which might be specific to their class. We regularly review and update our PSHE Scheme of Work to ensure that it addresses changes and developments around the world and reflects the needs of children at Brookfield. Teachers view all resources before they are used to ensure that their content is appropriate, relevant and up-to-date.